Melt Grilled Cheesery (yes there's a thing called cheesery hehe) is a gourmet "grilled cheesery," the first restaurant of its kind in Manila serving a unique variety of the ultimate dream cheese dishes. 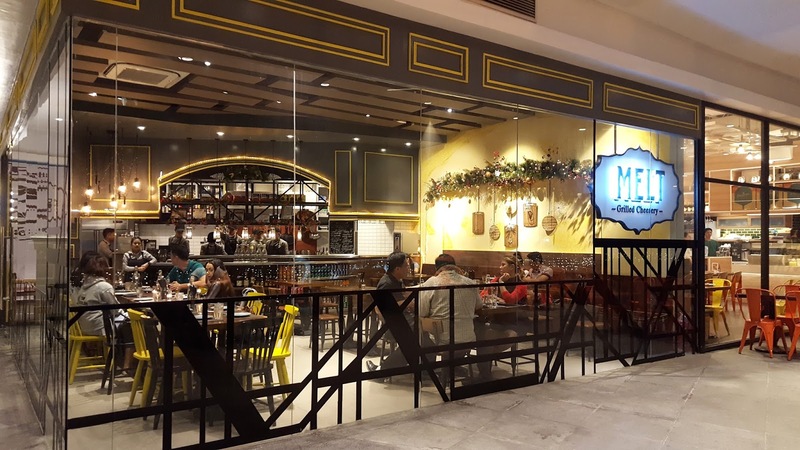 It is their queso-quest to provide the happiest dining experience to all cheese lovers. Melt welcome our customers and wish to celebrate their joyous moments, comfort them in their rainy seasons, and make their average days a little more special through Melt's warm service and house blend of melted cheeses--the world's age old secret ingredient to gastronomic happiness. 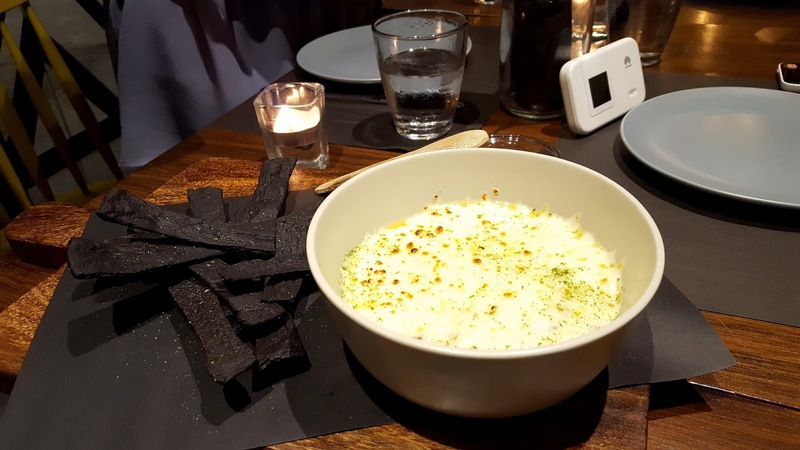 Mushroom Truffle Cheese Dip With Parmesan Crisps - Isn't it that just the name of this menu entry made you drool like a crazy dog? When it was time to devour this dish, it was gone in seconds, literally, and I mean, like, gone in seconds! Like a tornado swept everything away. I loved that I could really taste the truffle flavor in the cheese dip unlike all the other truffle dishes that I've tried that made me question the essence of life... uhhmm... just kidding! I mean, some dishes say there's truffle in it but you can't even taste it, not even a hint. But this... this, the truffle flavor was so bold and in-your-face, it's legit! 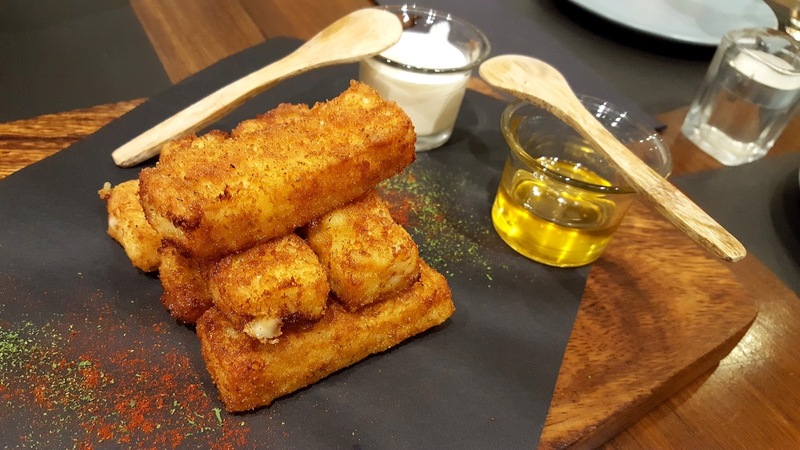 Mac & Cheese Bars - Fried mac and cheese bars served with sour cream and honey dips. At this moment I thought I just died and went to heaven. Every bite was Nirvana! And I didn't know that cheese paired with honey is the ultimate combo! This is highly recommended! If I am to rate this in a scale of 1-10, I'm giving it a 15! Pure genius! 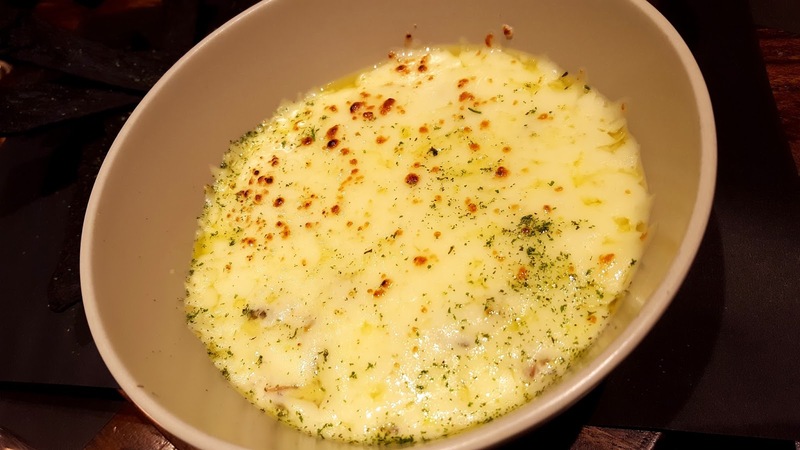 Cheesy Fries - this is something new on Melt's menu and we're glad that we are the ones to get first dibs. 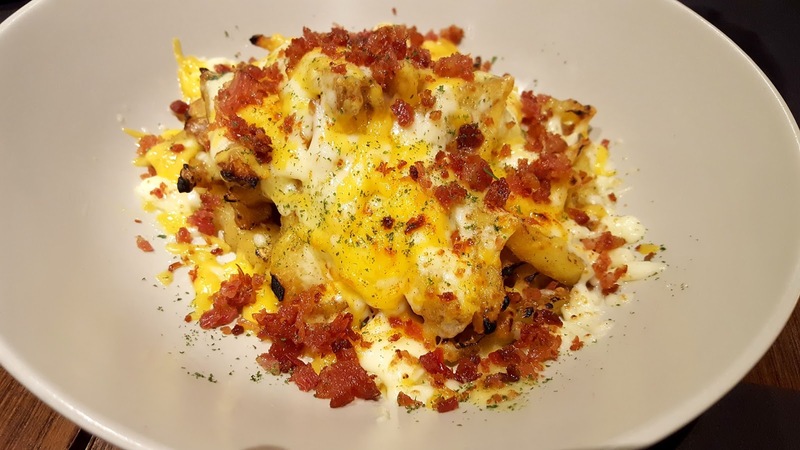 Well how can you go wrong with fries, melted cheese and bacon bits? If you don't agree with me, well, we can never be friends. 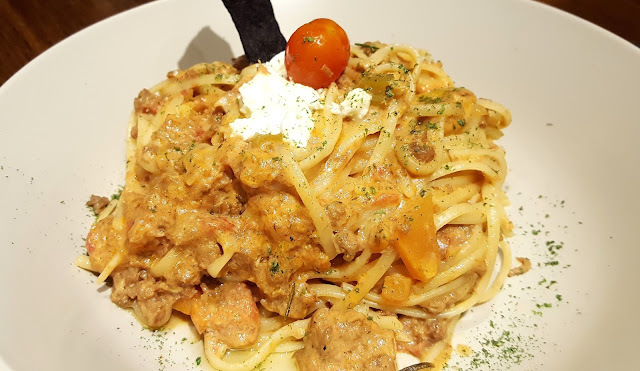 Creamy Tomato Meat Linguini - linguini tossed in Melt's Bolognese sauce finished in cream topped with cherry tomato confit, garlic confit, rosemary oil and goat cheese. That's dairy overload but I ain't complaining. 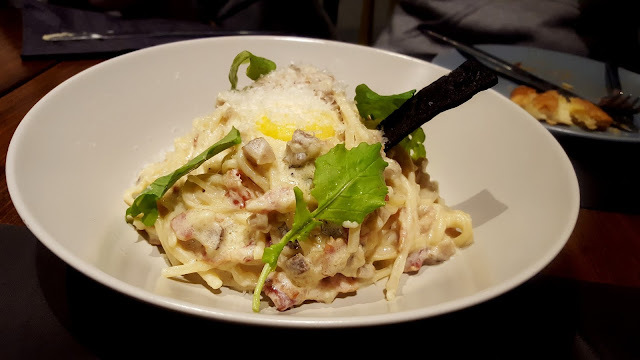 Mushroom Truffle Pasta - Farfelle tossed in truffle mushroom cream sauce topped with arugula and aged kesong puti. 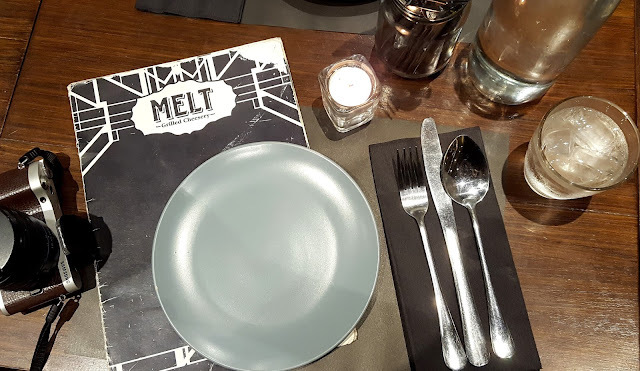 I really need to give Melt a two-thumbs up for their dishes with truffle, because you can seriously distinguish the truffle flavor. The arugula also gave a good texture to this pasta dish. 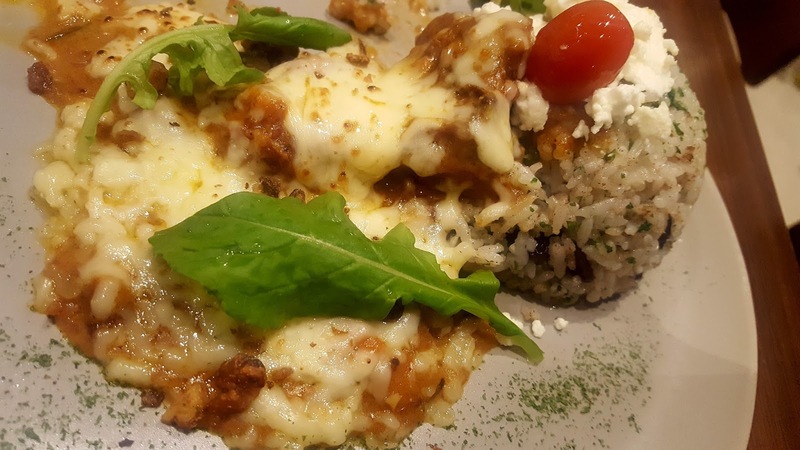 Chili Cheesy Rice - Chilli con carne and Barese sausage rice topped with house-blend of melted cheeses, sauteed cabbage, sour cream, Mexican salsa and fried cinnamon bananas. Whew! 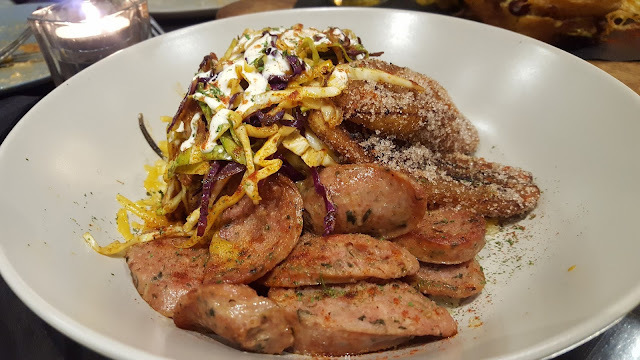 That's a lot of flavor in one dish, and it did not disappoint. It's like Mexican rice with beans/Arroz a la Cubana on steroids. 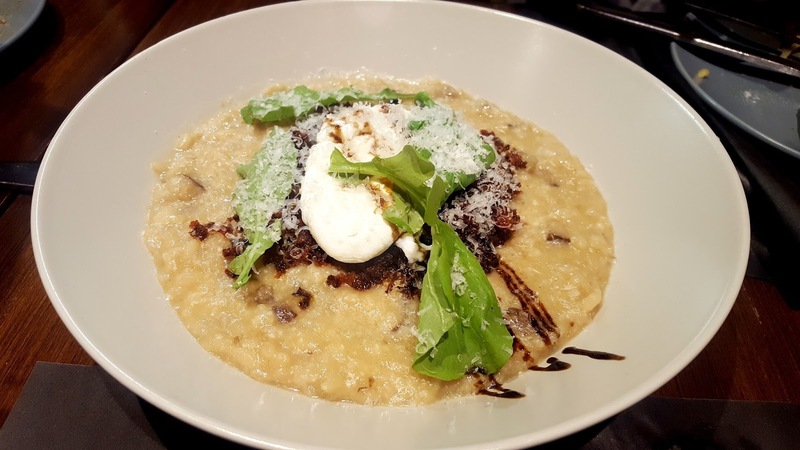 The Beefy Cheesy Rice - beef stew on raisin buttered lemon parsley rice topped with house-blend of melted cheeses, candied walnuts and cilantro. I know... I know... beef, cheese, rice, it's too much. But it's temptation in one plate I can't help but commit. The cubes of beef were tender, by the way. Chorizo Tocino Risotto - another new entry on Melt's menu. This contains tocino, poached egg, arugula, and rice with cheese. This will remind you of the well-loved Filipino dish Tocilog but interpreted abstractly by someone like Picasso. 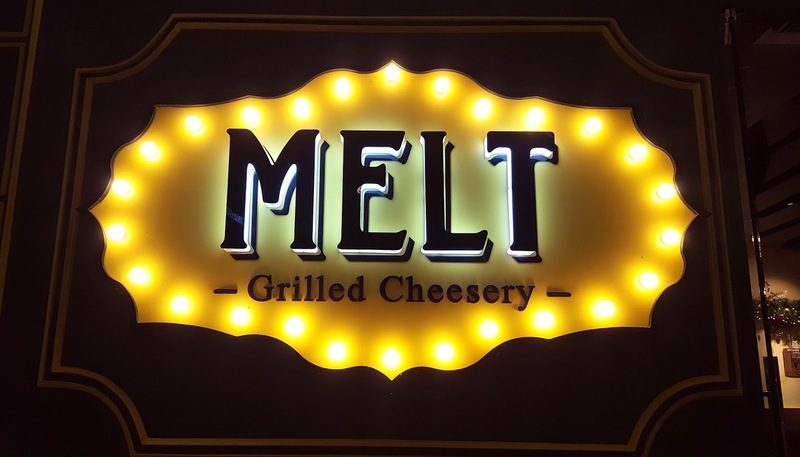 Chili Con Queso Sandwich - Melt's house-blend of melted cheese sandwich between honey-drizzed Sardough bread. 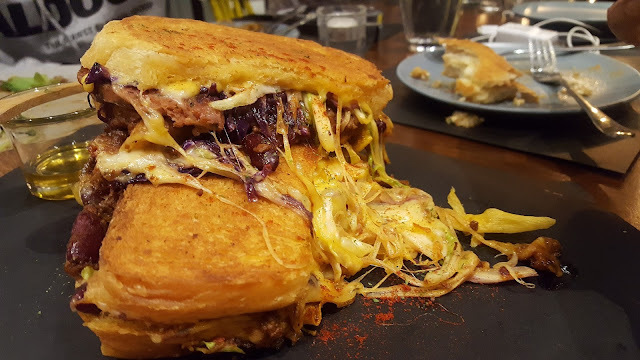 Surprisingly, among all the grilled cheese sandwiches I've tried that night, this one made it to the top of my list. Probably because I also love Mexican food and the unique combo of the flavors appealed to my love for that cuisine. 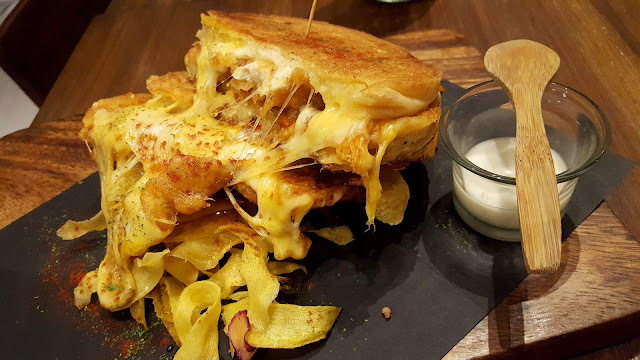 Big Buff Sandwich - Melt's house-blend of melted cheeses with Buffalo butter coated chicken breast, pepperoni, red bell pepper, caramelized onion, smoked paprika and aioli in Sardough bread. This came with sour cream dip too but on its own it's super good already. 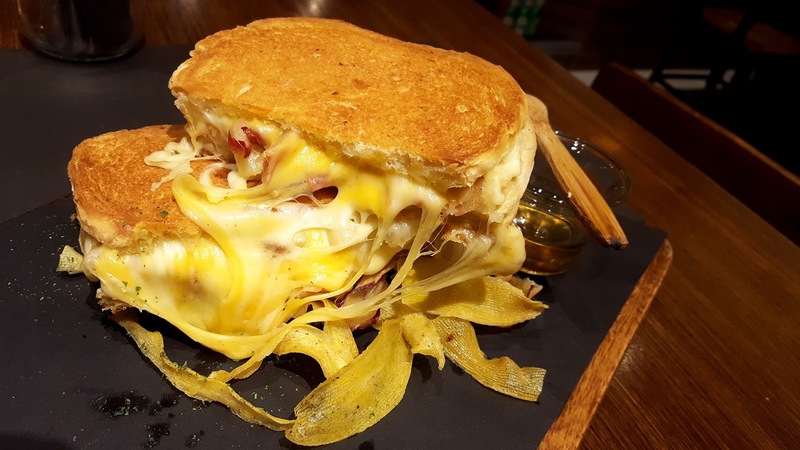 Bacon Mac & Grilled Cheesy Sandwich - Maple-glazed bacon and three-cheese mac and cheese sandwich between honey-drizzed Sardough bread. Yep, mac-and-cheese sandwich, I just died. 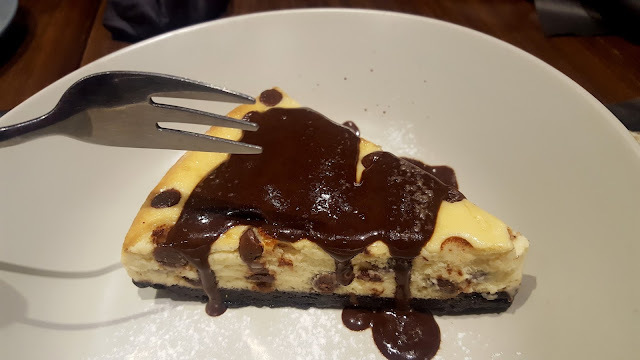 Chocolate Chip Oreo Cheesecake - one of the owner's Mom's signature recipe with Melt's signature chocolate sauce. 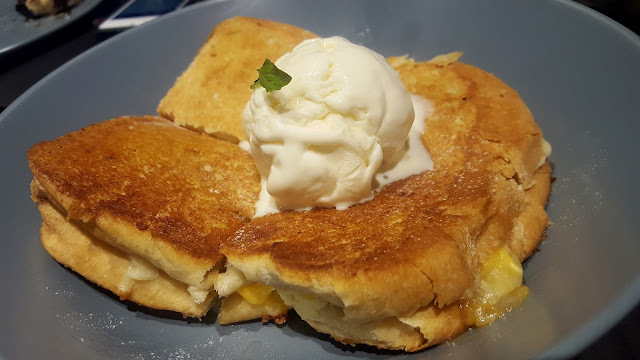 It had the right amount of sour and bittersweet in every bite. Melt also serves a good range of beers and wines that will go well with the sandwiches and pasta, just ask the servers what would go well with your order. The sandwiches can also be served using premium hand-made black-bread brioche for an additional amount. It was cheese-overload indeed, but you got a lady here smiling like crazy and full of joy. It felt like I've been transported to one of my happy places. I think I had too much cheese that night that I couldn't stop talking about it the next few days and telling everyone to go and try it. Definitely recommending it and going back! 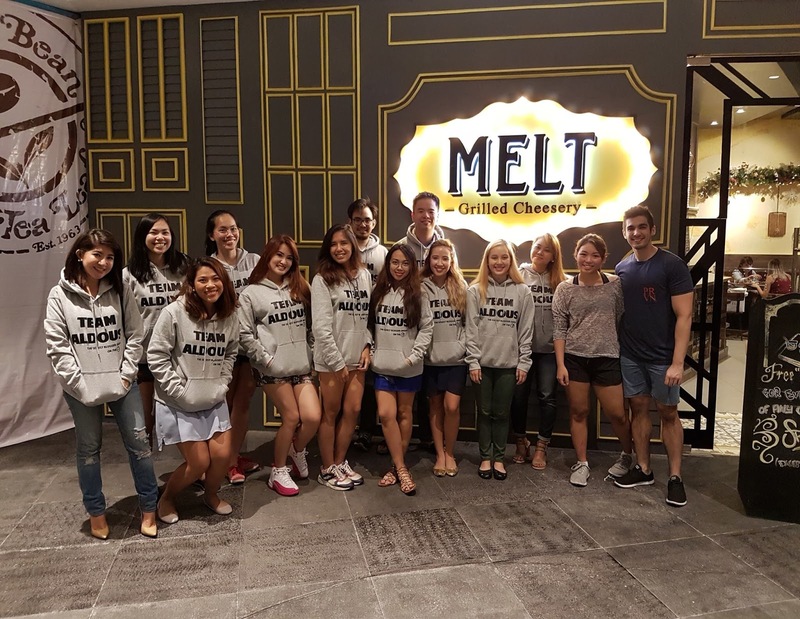 Thanks Melt for having us over! I badly need this in my life!!! Hu Hu Hu!